If you could choose three bikes from all the ones you’ve ever ridden, which ones would they be? 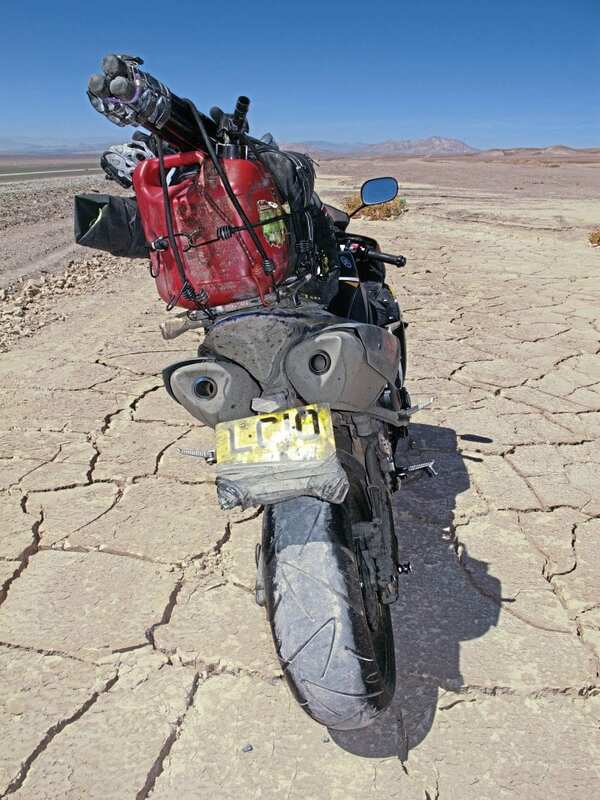 We asked Nick Sanders, a record-breaking adventurer and round the world rider, to write about three bikes that have been important in his life – ones that he would take on a desert island with him. 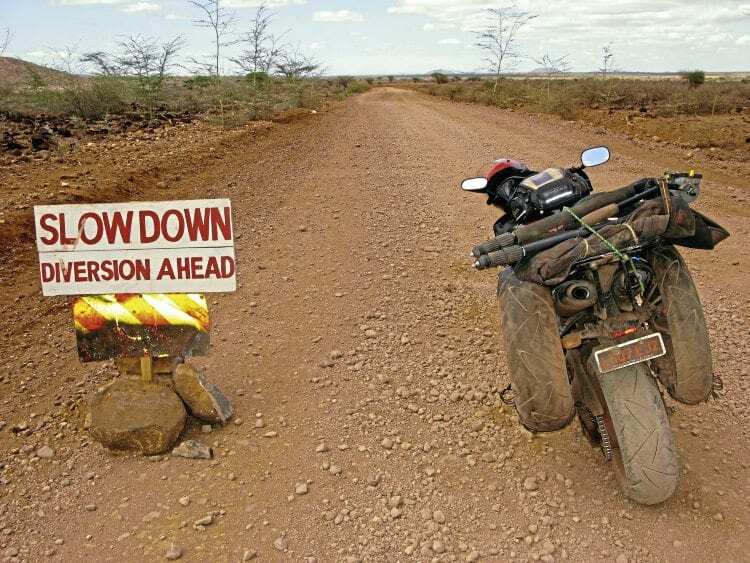 The R1 is not the obvious choice of bike for crossing a desert. How much did I love this bike? Abstractly. That means I loved it but it made me work hard for that love. I loved its pearl-shaped tank, the perfect pin striping around the painted metalwork. I loved its sound. The little single ‘blat-blatting’ gave me presence as we rumbled down narrow streets, climbing high into the Himalayas, to hill stations for scones and creamed tea. It made me dizzy for adventure. 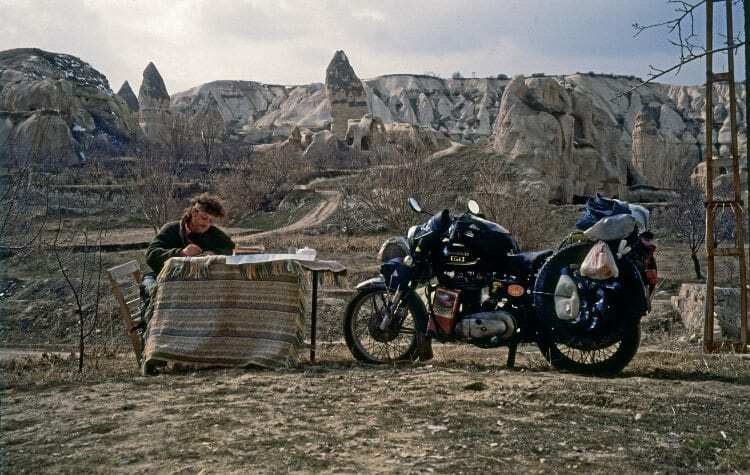 Nick and the Enfield in Cappadocia. Its Indian-ness gave a feeling of a private one-ness with a billion people in Asia Minor, many of them hoping to own an Enfield one day. 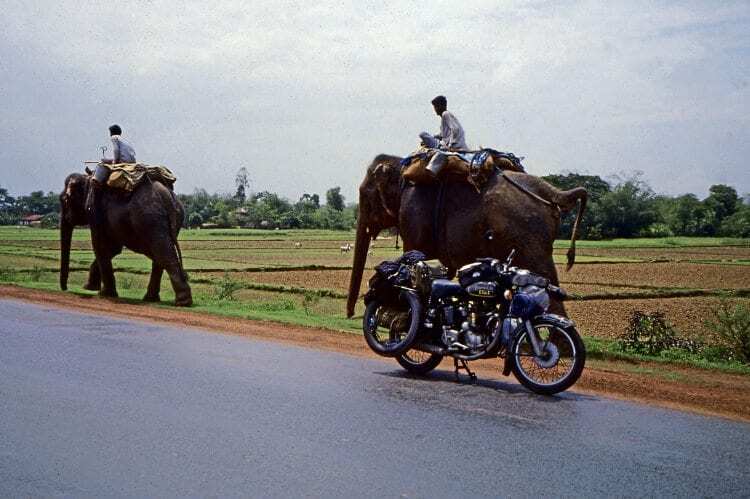 When I rode across India I was riding the Rolls-Royce of motorcycles, loaded to travel around the world, looking dusty and venerable. A bit of elephant dung won’t hurt. Wind back a year, to 1992. Something had holed a piston in my Honda 250, coincidently outside an Enfield Dealership south of London. I walked in confidently (or was it desperately), and within a day had completed a meeting with the Indian importer and talked them out of a bike. I didn’t know it then but when you expect a bike to be perfect you soon learn to accept it for what it is. 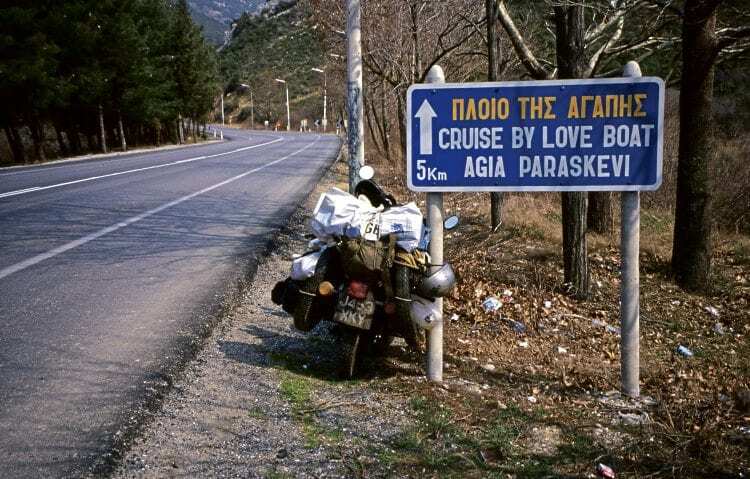 In the science of second-guessing I set off to ride 38,000 miles around the world on a bike with a reputation as being as reliable as a milk float. I understand the concept of optimism, and think the opposite is an ‘achievement killer’, but with 1950s machinery, forged with third world technology, do you reluctantly accept the sincerity of the pessimists? Here was a bike with a self-destructing wiring loom, a rocker assembly made of aluminium, so needing steel screw inserts, and a big end vulnerable to sudden volatility. 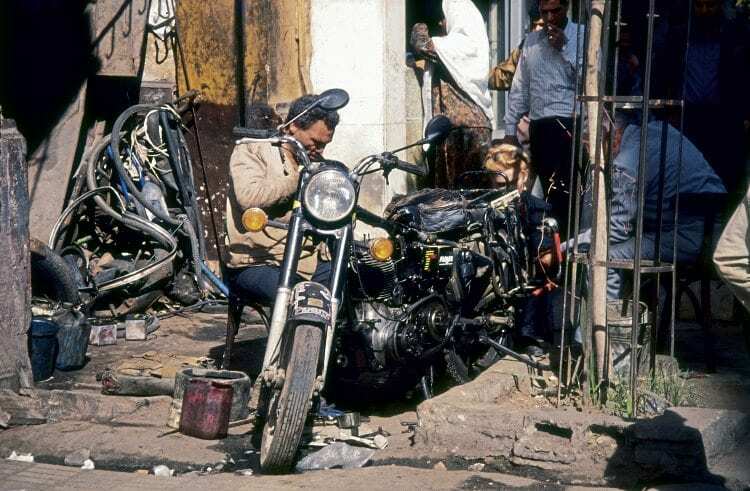 Abruptly hitting an incline south of Damascus in top, either the sprag clutch snapped – that which transmits rotational power via the engine sprocket to the crankshaft – or I’d splintered the main bearing? Either way it was mechanical dyspepsia, the type of which this bike never failed to dish out. Even the fast riders stop for the pyramids. 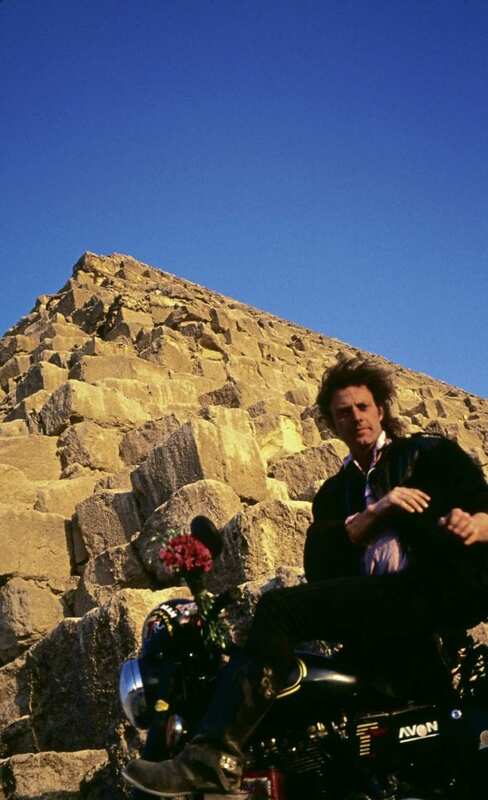 Now in the back of a horse and cart, it was fake news just then to think I was still motorcycling around the world as I limped to the Jordanian port of Aqaba, ferried it to Nuweiba and ended up in the cargo area of a pickup across the Sinai to Cairo as a gentle pile of parts. It was then flown to Delhi where the factory instructed it to be repaired. The Bullet is being worked on in Cairo. Sometimes in life you get your heart broken in the right way, and through all the technical deceit of a bike that only half worked, there was never a day I didn’t fall in love with that little bike. 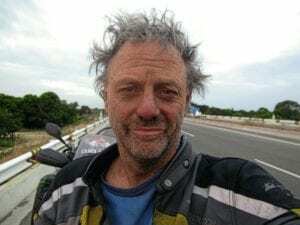 This was my first of seven rides around the world and it was a pleasure to have learnt how to do it on my beloved Bullet. The ‘X’ stands for four-strokes and the ‘T’ for Trail. Inspired by bikes on the Dakar Rally, the XT660R was first released in 1976. Some reviews canned this little, yet not so light bike: Super build quality they said, but the brakes were woeful, the fuel injection scrappy at low speeds, and a top speed of 90mph after which the bars started to weave. It was a long-distance tourer that you rode if you couldn’t afford anything else. The 48bhp engine was never going to give you whiplash from a standing start, and yet, I loved every minute of riding it. The XT660R was simple. So was the journey. 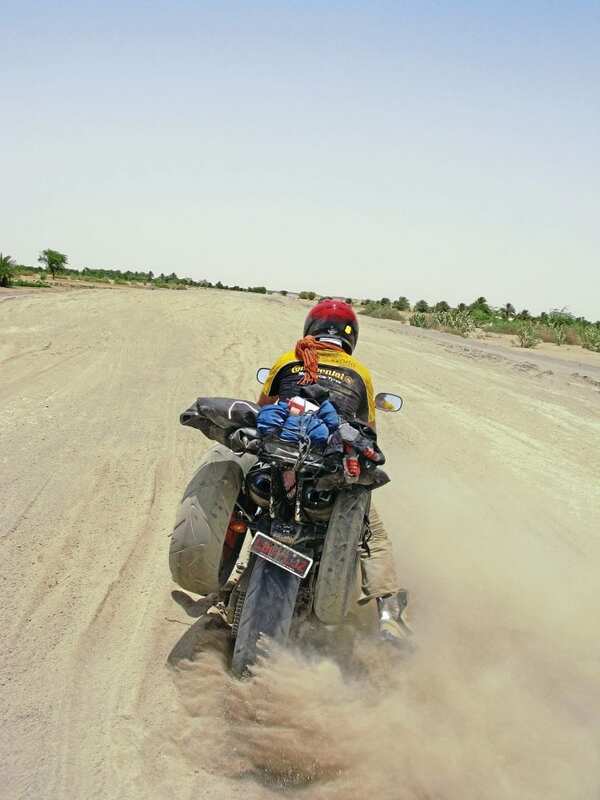 The ride to Timbuktu – much like the bike – was not complex. In 2009 I left behind the English winter. In the deep south of Morocco, after several hundred miles of nothing but brown and parched green landscape passing me by I saw a brightly painted set of shutters on a house in the distance, and it struck me how, if anything distinguishes the desert from anything else, it is this obstinate use of colour. It’s a long way to Timbuktu. Equally, perhaps it was the simplicity of design on a bike that lacked extraneous nubbins to pull, push, switch or press that I liked on such a simple journey – it was on for go and off for stop. The lack of pretension was awesome. An undemanding bike to ride, it definitely had road presence and for me the flat torque delivery fulfilled all my wishes out of corners without any fear, but what I liked about it most was that it was unbreakable. Yamaha told me that the XT uses a tubular steel frame with two upper frame tubes, the engine being utilized as a stressed member and while brake delivery was criticized by the road testers, for me, the 320mm floating disc and Brembo four-piston caliper was in the field, in Africa, in the dirt, decisive and safe, pulling me up with just the right deceleration to keep me out of trouble smoothly. 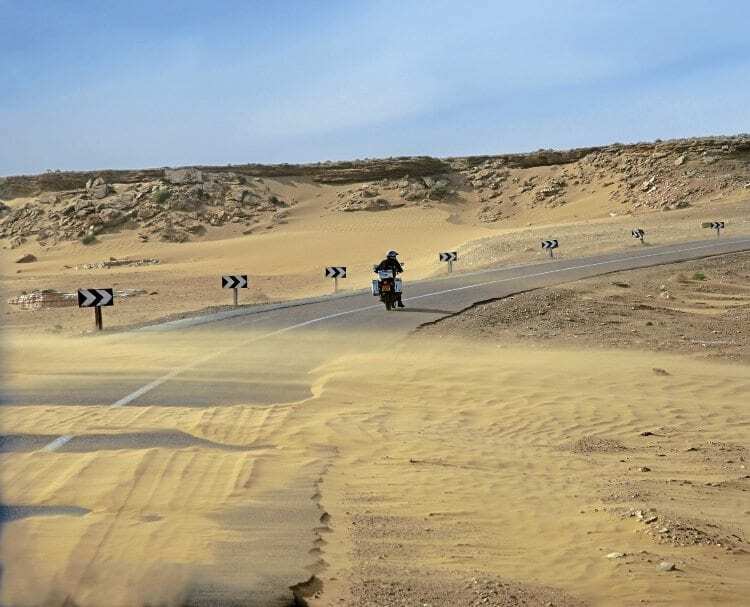 On my ride along the edge of the Sahara desert, sheets of fine sand skated across the landscape and the road. Africa was still on the move. Squeezed in between the nothingness, the bike and me passed small villages and towns to give some depth to a two dimensional landscape. Here by the coast, sea and sky fix land to air and the landscape offers not a due as to where you are. Looking the other way, sand stretches as far as the eye can see. The light filters through a hazily drawn horizon and nature’s elemental circle of land, sea and air mingle with this little bike and we all became one. I had the privilege of riding four times around the world and twice up the Americas on Yamaha’s flagship superbike, magisterially known by the acronym YZF-R1. 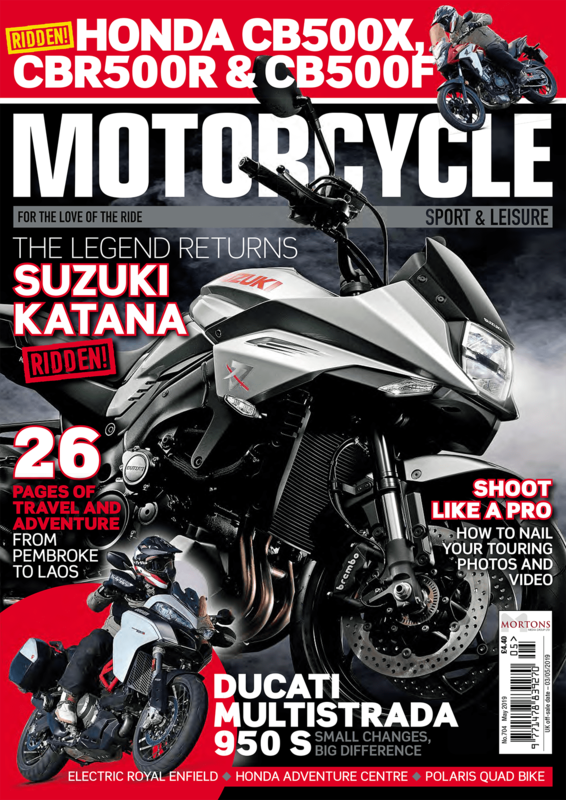 ‘YZ’ is Yamaha’s designation for road bikes, ‘F’ for four-stroke and ‘R1’ marks a litre class bike – and so armed I did what in context was then unthinkable. 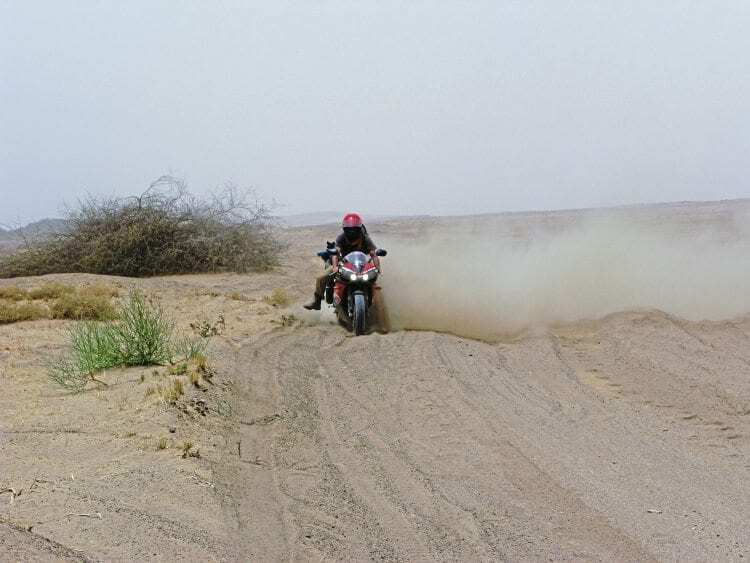 After my 1996 Guiness record for the fastest circumnavigation on a Triumph Daytona was pulverized by the Sanders’ pairing of Kevin and Julia, my then contemporary rivals, it was exigent in 2005 for me to reduce the record further by four hours. My choice of bike, the R1, was a mere 172 kilos with a rear wheel bhp of 171, giving it awesome overtaking capability. With its radially mounter caliper brakes, underseat exhaust and the RAM-air intake this machine offered a phenomenal advantage in snatching back minutes on each of my 1000-mile days. How much worse can the road get? This 19 day ride was my Journey Beyond Reason and complemented the mentality of the Yamaha engineers who decided on a no-compromise approach. The development team were given three clear targets: to make the highest power, the lowest weight and the most compact dimensions. They built a bike to go quick. 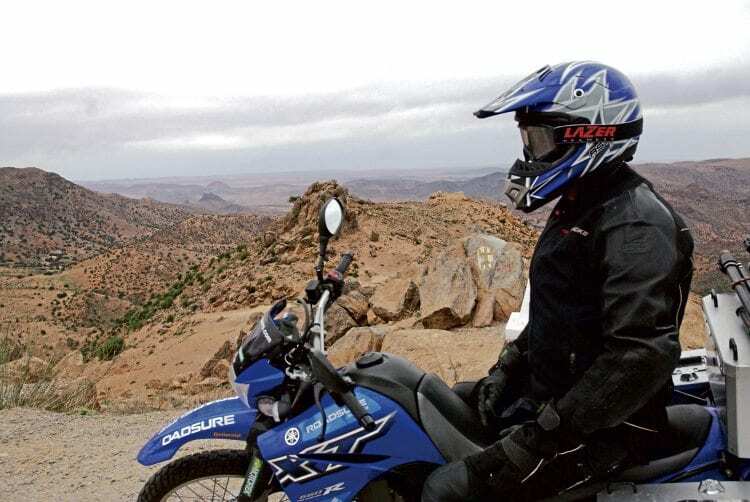 As a rider experience, the faster you went, the less you cared about the peripherals except for the fact that the more maximal the air intake, the better the engine performed. Sports bikes always gather a crowd. 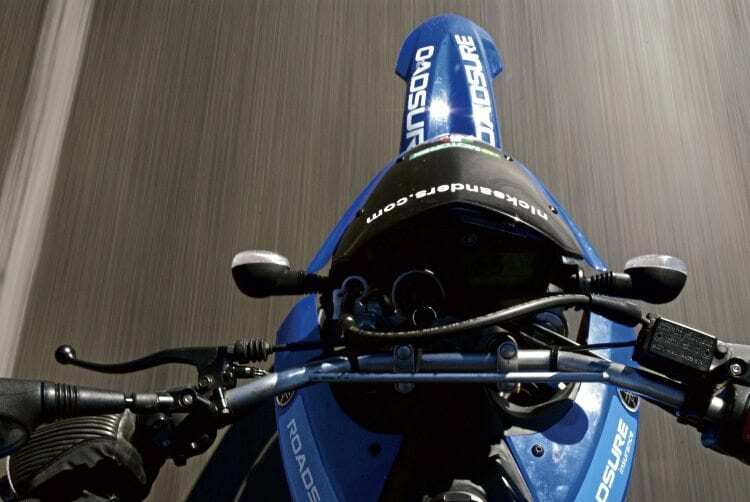 The 2005 versions was a pure a track machine as a road legal bike could be, and while John McGuiness used it to win the senior race at that year’s TT, I rode it to cross major metropolitan areas like Delhi in just over an hour. It’s precision in traffic was elementary to the success of such a project. From 2006 onwards I turned my attention to the world’s longest highway. The Pan Americana runs from Prudhoe Bay in Alaska to Ushuaia in Tierra del Fuego. This was the year Yamaha released a limited (Kenny Roberts) edition in original yellow racing colours, while I attempted this 16,000 mile journey several times. 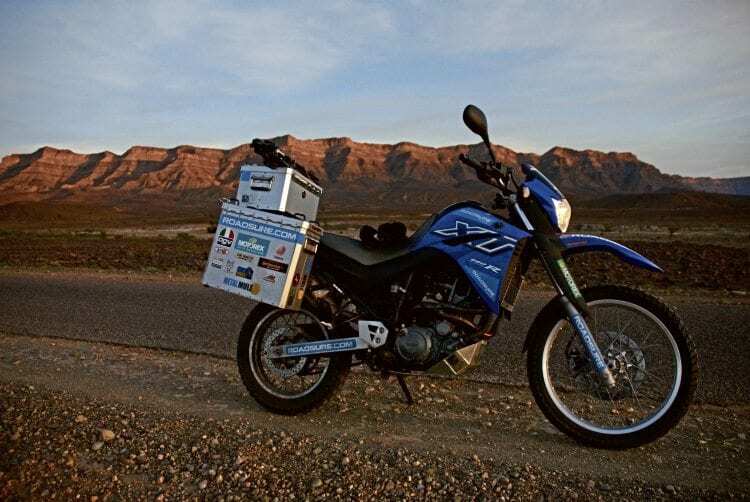 In 2010 the updated bike with its rock steady cross-plain crankshaft gave me more ‘road-plant’ and a feel of solidity but lacked practical luggage carrying capability. Using cross-plane technology, Yamaha claimed the bike would give the rider “two engines in one”, the low end torque of a twin and the pace of an inline four, and while the scientific evaluation of this engine was for me a partially understood concept, the post 2009 model I used for my Incredible Ride attempt boasted other advancements: The D-Mode Throttle Control Valve Mapping system allowed me to choose between three distinct maps depending on the terrain. Handy in the wet. Fuel consumption of 45mpg at 80mps wasted my time at fill-ups and I never found the projector lamps good enough for what I needed to do at night. 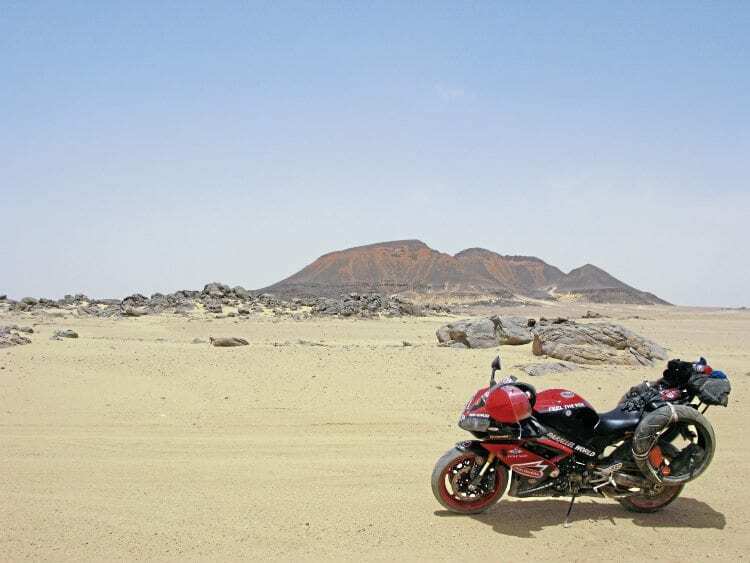 And irrespective of fast 0-60 and quarter mile timings – essential for scootering through traffic – the broader portfolio of what this bike was capable of, allowed me to conclude the fabled first transit of the roadless Nubian Desert. The R1 in all its manifestations was in my mind always the perfect tool. Nick Sanders has ridden around the world seven times, including a record circumnavigation of the globe in 19 days four hours. 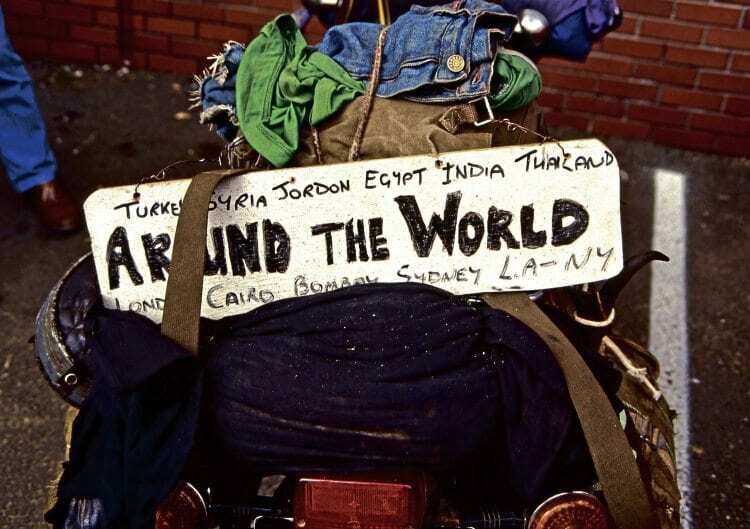 He has also taken a motorcycle the length of the Americas eight times, held the Guinness record for bicycling around the world, and still holds the Guinness record for cycling around the coast of Britain. 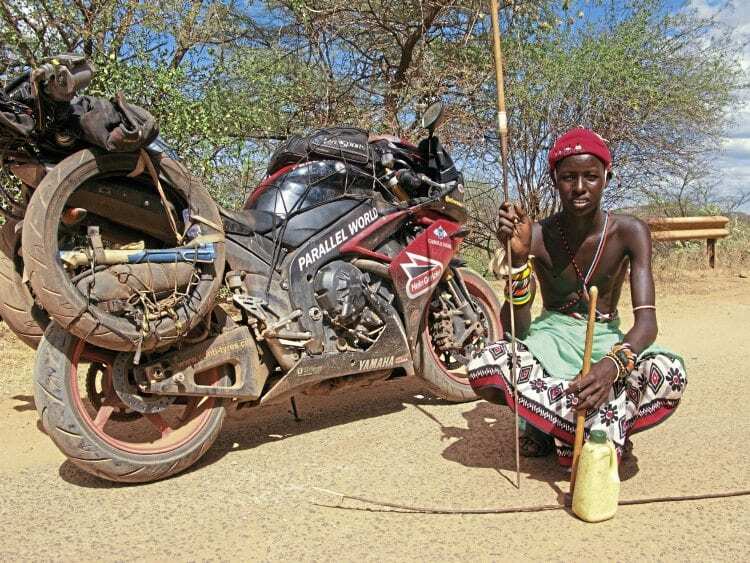 He has also cycled to the source of the Nile, across the Sahara to Timbuktu and the length of South America before taking two narrowboats across the English Channel and along the Danube to the Black Sea and back. Nick has even held pilot’s licences to fly microlights and hot air balloons.